Sharjah: Tucked away in the suburb of Sharjah city on Wasit Street near the Ajman border, lies a row of beige-painted villas near an Adnoc petrol station, with saloon cars and 4x4s parked in front of the main gates of homes. This represents how your typical Emirati neighbourhood looks like; quiet, with a close-knit community where bowls of dates and warm meals are regularly exchanged between homes. But in this neighborhood, food means business. For in one of the houses, with the UAE flag hoisted on the roof, lives one of the country’s celebrities who is known equally for his larger-than-life personality as well as for the Emirati food served at the Khaled Huriah Public Kitchen. A public kitchen is the equivalent of your average restaurant that serves traditional meals and desserts. Although the name ‘public’ might give out the wrong impression, the meals are not offered for free and customers do have to pay for their orders. There are usually no seating areas, and customers typically make their order at the cashier and then wait for the kitchen’s employees to parcel the food in soft aluminium containers. Or if they prefer, families also have the option of bringing their own casserole plates and filling them up on the spot. The Khaled Huriah Public Kitchen was aptly named as such after the man who owns the business, with two franchises in Sharjah – one on Wasit Street and the other at Tasjeel Auto Village along Shaikh Mohammad Bin Zayed Road. Huriah, which means ‘freedom’ in Arabic, is Khaled’s monicker coined by him at a younger age when he first started out as an avid supporter of the UAE national team, as well as the Sharjah Football Club. “I gave myself the nickname Huriah because I am the free,” he said. Khaled Mohammad Abdullah Al Hammadi hails from the town of Khorfakkan in the emirate of Sharjah, and comes from a family background whose professions consisted of engineers, teachers and high-ranking police officers. However, Huriah decided to forge a different path for his career from a young age when he expressed an interest in cooking, and learnt recipes from the local fishermen who cooked their daily catch for customers. As he grew older, Huriah’s strong passion for cooking was soon combined with his other hobby that he indulged in, which was supporting the local football team. For most of the young Emiratis who grew up in the 1980s, the face of Huriah and his boisterous personality remains etched in the memories of their childhood. 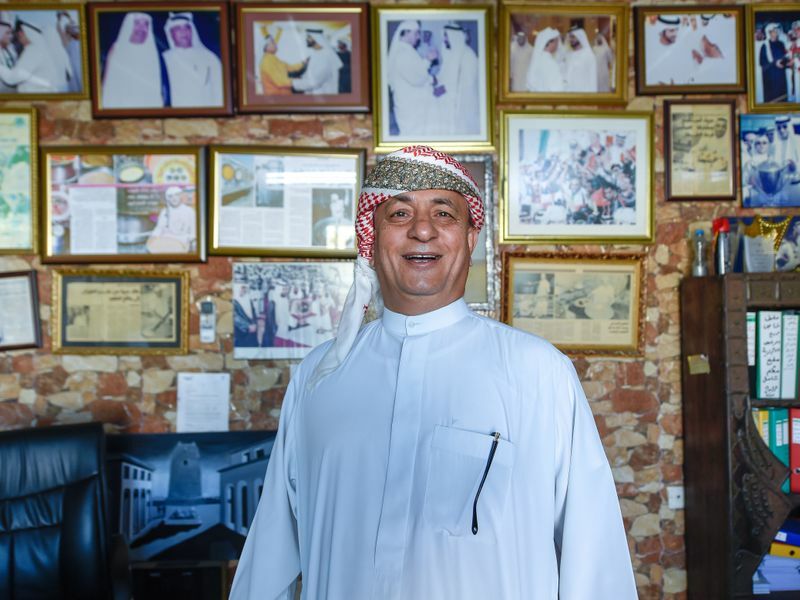 “When I wasn’t cooking meals, I was participating with my troupe of 60 men who each played an instrument, and since 1979, we would go to every single football match to watch and support Sharjah Club. We would also follow the UAE national football team everywhere they played,” he said. Khaled Huriah (far left) cheering the UAE national football team during the 21st Arabian Gulf Cup in Bahrain, 2013. Dressed in the colours of the UAE flag with an entourage of musicians, children and adults alike quickly came to know Huriah and his playful antics. As Huriah took the Gulf News team into his kitchen, his legion of fans continuously watched his live updates of the interview, which accumulated to 7,900 views in one hour and a half. One video in particular that grabbed the attention of social media users was when Huriah explained his role at Sharjah Football Club, much to the delight of viewers, who saw him colourfully express his career as a cheerleader. “I was not a coach or a player or a referee. When the player scored, I would be beating the drum and cheering on the team,” he said. “I am a patriot. And so I took it upon myself to raise the spirit of players and supporters with my enthusiasm and love for the country,” he explained. 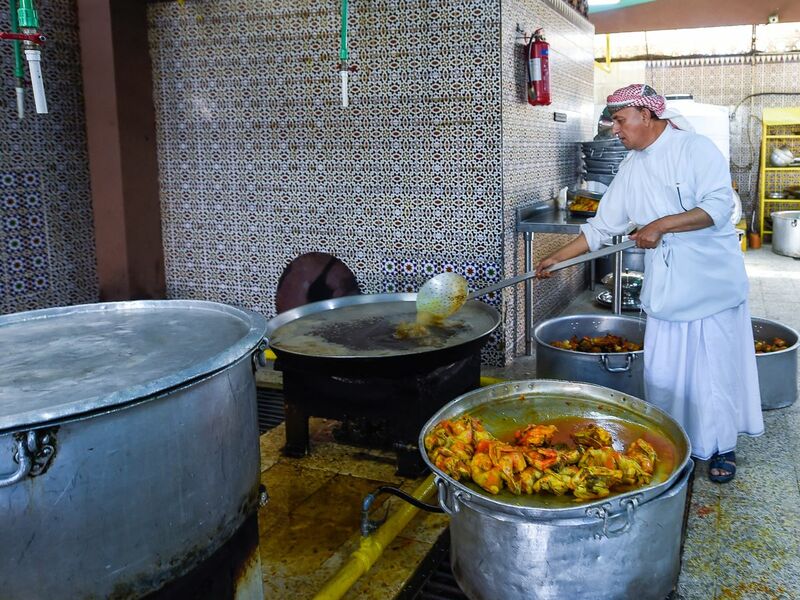 Huriah set up his first public kitchen on Sharjah’s Wasit Street in 1989, and has been serving authentic Emirati food to generations of families for 30 years, gaining a significant fan base not only for his delicious recipes but also for his public role in the community and for his patriotism. Due to health reasons however, doctors recently advised Huriah to take a back seat from his band of musicians and give his heart some much needed rest. “That gave me much more time to connect with people on Snapchat,” he said, who now has a dedicated fan base of around 500,000-600,000 views per month on his personal account. Back inside the kitchen, Huriah’s staff continue to diligently work as they prepare to receive customers at noon. The busiest time in the kitchen is from 6-8am when employees start preparing the ingredients and cook the batches of chicken, meat and fish in an array of large metal frying pans and pots. Laham biryani is very popular and is ordered all the time… But you need the head of the lamb to complete the dish. The head is like gold. “Harees is the most popular dish during Ramadan, as the sales spike enormously. The ingredients include veal, wheat, rice, ghee and a bit of salt. It is traditionally grinded with a mortar but to save time and energy, I invented my own machine that does the trick,” he said, while pointing to a metal pot installed with an electric mortar. “During the rest of the year, customers like to eat everything from meat biryani and balaleet (sweetened vermicelli served with an omelette) to foga (fish with rice) and luqaimat (fried sweet dumplings)”. The Emirati kitchen offers customers a wide variety of main courses and desserts, including biryani, khameer (bread sweetened with dates, cardamom and a pinch of saffron), sago (tapioca), madhrooba (a mix of salted fish, spices and thick sauce, sprinkled with saffron), khanfaroosh (fried saffron and cardamom cakes) and also malih (salted dried fish). Prices at the restaurant are pretty reasonable given the size of portions offered. 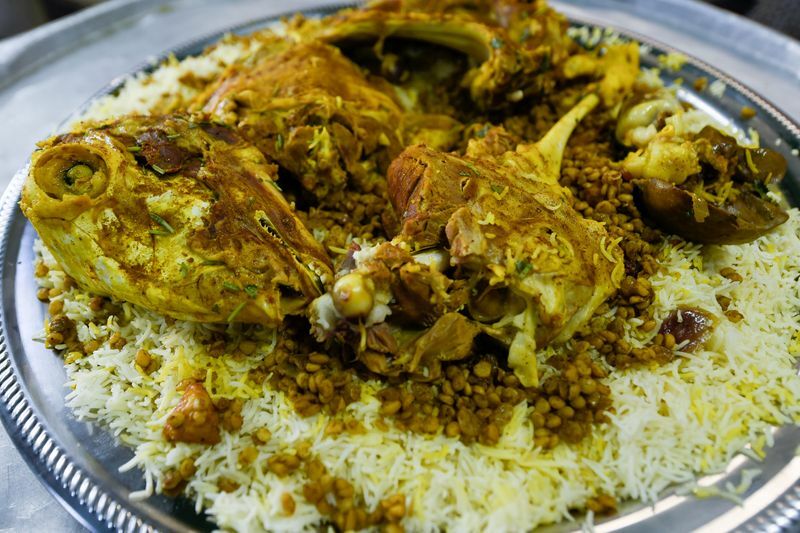 A quarter plate of chicken biryani costs Dh15 and a whole plate of laham (lamb) biryani will set you back Dh40, while a plate of harees is set at Dh10 for a small portion and Dh20 for a large one. “Laham biryani is very popular and is ordered all the time. That is because people can eat it on a regular day or if they want to mark an occasion, such as weddings, engagements, if their child graduated from high school, if they bought a new car, or to serve it at mourning tents. There is never just one occasion to eat biryani,” said Huriah. “But you need the head of the lamb to complete the dish. The head is like gold”.